Renault Sport Formula One Team endured a frustrating qualifying for the Grande Prêmio Heineken do Brazil at the Autodromo Jose Carlos Pace with neither driver able to break into the top ten. Carlos Sainz was unlucky in Q1 with traffic affecting his final lap, meaning he missed out on the next qualifying session by a mere 0.005secs. Nico Hulkenberg did make it into Q2, but the mixed weather conditions with showers of rain meant the challenge was being on track when conditions were most favourable. Nico ultimately ended the session with the fourteenth fastest time. 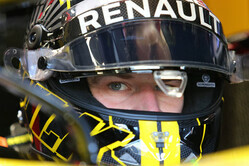 Nico Hulkenberg: "We were missing two or three tenths out there today. Q2 was especially challenging with the rain looking to come in and we probably made the wrong calls on timing, but with hindsight that's easy to say. It was difficult to know the grip level and judging how much you can push the car into corners. We got everything out from the car but we're lacking a bit of pace, which is why we don't look so great on the timesheets. Tomorrow will be tricky with our starting position, but we'll be realistic and fight for a good result." Carlos Sainz: "It was a disappointing Saturday in general. We knew it would be tight out there and things just didn't work out. The single-lap pace hasn't been there all weekend for us. Our long-run pace looked more promising on Friday and we know tomorrow is a new day. We have some options to explore on strategy and we'll be giving it a go in the race, like always." How do we reflect on today's qualifying? Alan Permane, Sporting Director: It was a difficult session on both sides of the garage, but the underlying factor is that we've struggled with single-lap pace today. Both drivers felt they could have gained one or two more positions; Carlos suffered with traffic on his final lap and Nico was in a difficult situation with the timing of his runs in the mixed conditions, but ultimately the car isn't as quick in qualifying as we would like it to be at this track. What can we expect for tomorrow? AP: We still remain positive ahead of the race. On Friday, our long run pace was good and we were happy with the car. We've improved the balance since yesterday and both drivers seem to be happy. It looks like it will be a dry Grand Prix but, as we know, anything can happen in Brazil.